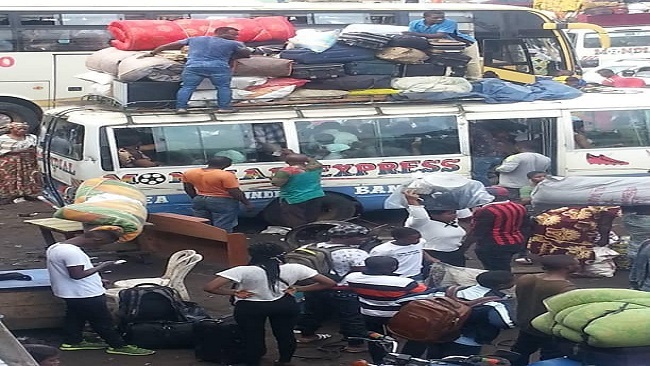 The Southern Cameroons crisis which started as a demonstration by teachers and lawyers in Cameroon’s English-speaking regions is finally migrating to East Cameroon, as thousands flee Southern Cameroons following threats from Southern Cameroonian fighters to stage sporadic attacks on soldiers and punish civilians who have been cooperating with the Yaoundé government. All major cities in Southern Cameroons have become beehives as helpless civilians struggle to find a safe place before the expiry of the deadline given by the fighters. 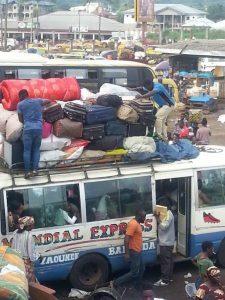 Buea, Mamfe, Limbe, Bamenda and Kumba have all witnessed huge crowds struggling to leave, following warnings from Southern Cameroonian fighters that from September 16, 2018, all roads will be blocked and there will be no movement in the region. More than half a million people have, on Wednesday, been seeking ways to leave the region as presidential elections scheduled for next month approach. Southern Cameroonian fighters have warned civilians in the two English-speaking regions not to participate in the elections as they are considered foreign and illegal. It should be pointed out that Cameroon will be holding presidential elections next month and the incumbent is widely expected to win. Many analysts hold that much will not change in the country and the conflict tearing the country apart may only get worse if Mr. Biya wins the elections. So far, the government has not issued any statements to reassure the fear-stricken population and local officials have been tight-lipped over the displacement of over half a million people in the region. Meanwhile, the fighting between restoration forces and army soldiers has intensified. Over the last week, more than 200 civilians have been killed in the region, while some 50 army soldiers have been sent to an early grave by restoration forces. The government has been struggling to localize the Southern Cameroons crisis, but as the fighting intensifies, many people are seeking refuge in the French-speaking region of the country. The mass movement of Southern Cameroonians into other parts of the country has resulted in escalating food and housing prices. The high living cost is keeping government officials in cities such as Yaoundé and Douala awake all night, as they fear that the increasing pressure might cause the cash-strapped Francophone population to rebel against the government. The Southern Cameroons crisis has taken its toll on the country’s economy, with state corporations such CDC, the country’s second largest employer, laying off many of its workers. For the country’s lone oil refinery, SONARA, the times are getting tougher by the day. Southern Cameroonian fighters have their eyes on this corporation which they accuse of shipping their oil wealth to East Cameroon. They also hold that the corporation is being managed by French-speaking Cameroonians whom they accuse of treating Southern Cameroonians with disdain. This has been one of the many sticking points in this conflict that will have a long lasting impact on the country for many decades. The hardest hit is PAMOL. The palm oil producing company located in Ndian Division, has simply shut down operations and more than three thousand workers have been sent home, following disruption and threats by Southern Cameroonian fighters. The country’s economy has taken a nosedive due to the disruption of economic activities in the two English-speaking regions of the country. It is estimated that the economy is losing more than CFAF 6 billion a day and the government needs more than CFAF 10 billion a day to prosecute the war that is not going to end anytime soon. Meanwhile, the government is frustrated with what is happening in the northwest and southwest regions of the country. All attempts to bring things under control have failed. Its divide and rule tactics have failed and even money has not been able to douse the fire. Earlier in the year, the government had thought that kidnapping and repatriating Southern Cameroonian leaders to Yaoundé would help weaken the rebellion that has successfully given the country a bad name. Though some 47 Southern Cameroonian leaders, including Sisiku Julius Ayuk Tabe, are in jail in Yaoundé, the insurgency has grown by leaps and bounds. The Diaspora has been financing the war and the fighters on the ground have been giving the government a run for its money. So far, more than 1,000 army soldiers have been killed while it is estimated that some 3,000 civilians have been murdered by government troops. The government’s strategy of collective punishment and the burning of home have not produced the desired results. On the contrary, they have been counterproductive. Many moderate Southern Cameroonians have been radicalized by the government’s strategy and this is making it hard for the soldiers to wrap up things militarily. In a desperate move, the government has issued a warrant of arrest for many members of the Interim Government, including Dr. Sako Ikome and Mr. Chris Anu. The warrant, signed by the country’s national security boss, Martin Mbarga Nguele, urges all Cameroon embassies abroad to take appropriate measures and if possible kill those whose names feature on the warrant. The government seems to have been cornered. It is fighting with its back to the wall. A war it thought it could wrap up in a few weeks is unfortunately taking too long. Cameroon is in a tight spot. The world cannot continue to play spectator to this unfortunate situation. Many lives have been ruined and the end is not in sight. While the country is bleeding, its leader, Paul Biya, is clearly missing in action. His incompetence, tribalism and nepotism have reduced a once prosperous economy to a living hell for many Cameroonians. Mr. Biya who is the architect of the civil war spends most of his time out of the country due to his failing health. For 36 years he has not been able to build a state-of-the art hospital in Cameroon. He is currently in China. Since going to China for the China-Africa Summit, Mr. Biya has not returned to a country whose economy is begging for an extreme makeover. The days ahead will be challenging for the country. The upcoming election may tip the country into political chaos. Mr. Biya is very unpopular, but he is intent on ruling the country again for seven more years. Cameroonians are tired of Mr. Biya and his old cabinet. They know elections will not address the issues. Mr. Biya has never won an election and it is clear that he will rig the election to stay in power and this does not augur well for the country. A victory for Mr. Biya will imply Cameroonians will have to put up with a civil war, unemployment and a rising wave of internally displaced persons. The world has to step in. Cameroon needs help. The killing has to stop, but it will not stop if Mr. Biya and his cohort continue to lord it over their people.